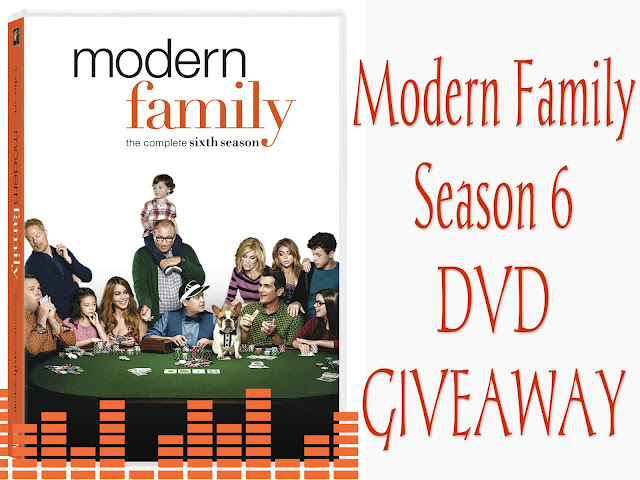 Maria's Space: GIVEAWAY: Modern Family Season Six DVD #Giveaway PLUS #MODERNFAMILY Trivia! GIVEAWAY: Modern Family Season Six DVD #Giveaway PLUS #MODERNFAMILY Trivia! Outstanding Casting For a Comedy Series! It's everyone's favorite comedy series! Those awards don't lie. If you are not a fan, you haven't watched. Great cast and great script! My daughter and I love watching marathons when nothing is on and this is our go to show. Think YOU know everything there is to know about Modern Family? Think Again!!! I like Phil Dunphy the best because I think he is funny. Thanks for the giveaway. I hope that I win. I like Manny. I think he is very funny. My fave is Claire. She's a "real" mom. She juggles lots of stuff and has everyday struggles, and she's hilarious. Thanks. My favorite Modern family character is Gloria. My favorite Modern Family character is Cam, I think he is really funny on the show. Phil Dunphy makes me laugh in every single episode. This family is so much like mine it is insane! my favorite is gloria because she makes me laugh. I like Manny, he is the most likable of all the kids! My favorite is Claire because she is so uptight and everything always seems to go wrong for her. My favorite character is Cam. He is so misunderstood. He makes me laugh.